Distinctive and sophisticated, Hugo Boss BOSS BOTTLED. Eau de Toilette 200ml is a classic fragrance crafted for the man primed to succeed. As part of his daily ritual, BOSS BOTTLED. is the perfect finishing touch. A fragrance that matches his ambition and drive, the armour in his personal quest for success. A sensuous aroma with a vibrating harmony; inviting yet elegant with a clean and classic bottle that belies the warm fragrance within. BOSS BOTTLED. is an oriental fougère fragrance, with crisp notes of Apple and citrus in the top notes, and a warm and spicy heart of Cinnamon and Mahogany. As the fragrance dries down, the sensuous warmth of woods, Amber and Musk envelop the skin with irresistible allure. Head / Top Notes: Geranium, Bergamot, Lemon, Apple, Oakmoss, Plum. Middle / Heart Notes: Mahogany, Carnation, Cinnamon. Base Notes: Vetiver, Cedar, Vanilla, Olive Tree, Amber, Musk. BOSS HUGO BOSS BOTTLED. Eau de Toilette 200ml was found on 3 websites and was price compared using EAN: 0737052189765. 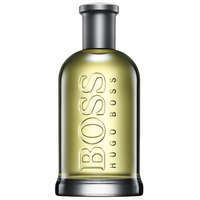 The cheapest BOSS HUGO BOSS BOTTLED. Eau de Toilette 200ml is shown as the main item, prices range from £66.95 to £79.00, excluding delivery. Price comparison based on price and delivery charges, with any valid discount codes being applied, is shown in the table above. Prices and information correct at the time of publication.